Technomad PA systems have useful ranges of up to 1 mile in radius. Giant Voice Systems – very powerful modular, wide-are paging and warning systems. Plays sounds on-demand, or automatically on schedule. Vehicle-Mounted audio systems – powerful, realistic, ruggedized. New! Ultra-portable Manpack PA systems – weatherproof, light (25 lbs!) and LOUD. Ask a Question Order Now! Technomad Military PA Systems include everything you need to project voice and music at long distances in real-world force protection applications, both mobile/tactical and permanently installed. Systems are pre-wired and ready for use upon delivery. » How reliable are Technomad Military PA Systems? » Can I get Technomad Military PA systems wet? » How clear / intelligible will speech be through a Military PA system? » Where can I install them? » What kind of power do they require? » Are there WIRELESS PA systems? » Can the systems be run from solar panels? » Can Technomad Military PA systems be used for shipboard / marine applications? » Why should I used Technomad Military PA systems instead of a “horn” system? » How is the sound quality? Can I play music through a Technomad Military PA? » Can I hook up my existing audio equipment to a Technomad Military PA? » How heavy is a Technomad Military PA? Can one person move it? » Can I mount a Technomad Military PA PERMANENTLY on a building? » What kind of operating range can I expect from the Technomad Military PA systems? 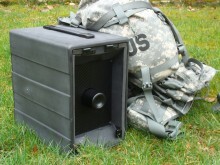 » Are Technomad Military PA systems expandable? Can I add more speakers to a basic system later? » I want to cover a LARGE area ( i.e. an entire base ). How can I do this? » What special training or knowledge do I need to have to setup and use a Technomad Military PA system? » Can I use Technomad PA Systems for Force Protection ? » I need more information. » I want to order NOW! » Are there wireless systems? 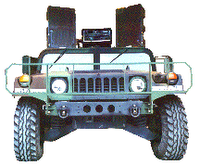 » Can I mount a Technomad Military PA system on a vehicle? » Can I use Technomad Military PA Systems for Force Protection?